[gt3r] Talk about your current status as a driver, terms, etc. I'm under contract with Audi, and drive in the SPEED World Challenge GT (WC) Series. Audi would like me to compete only in our WC event that weekend, so that takes me away from the ALMS events currently. They want me to stay focused. 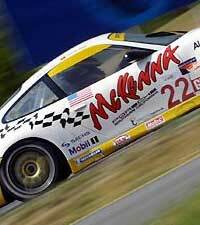 I ask permission for other series, such as Grand-Am, Grand-Am Cup. My Audi associates know that the practice keeps me sharp, and it works out for both of us. I drove at Petit LeMans in an Orbit car in 2003, but that was after the WC events came to a close for the weekend. [gt3r] What was the first GT3 R you drove? Impressions? Compared to the previous model line 993, 964. 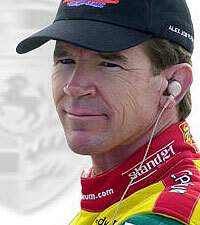 I drove with Bruno Lambert in late 99 at a Daytona test with Alex Job Racing. It was a rocket, significantly more power. Far superior in aerodynamics, hence more top-end speed. The GT3 R had smaller tires, and is heavier, so the handling tended to be a bit more touchy, much more sensitive to steering inputs. The 993 RSR was still faster through the corners under 2000 ALMS rules, due to the wider tires and lighter weight, but no where near the power or top-end speed. [gt3r] One of the few American drivers to ever have a Porsche factory contract, how did that come to be? I first drove with Alex when I was looking for a ride, and they needed a driver. I knew some of the team members, and that first race I ran with them we won! Alex and I really hit it off, and continue to have great chemistry. Alwin Springer and Alex both put in a good word, and the performances as a team in 2000, where we were consistently ahead of the factory team and drivers, led to the factory contract. I also ran very well at the Indy Porsche Supercup races in 2000. It was quite an experience, a high honor, and I am very pleased to have had the opportunity. It was a one-year deal. Porsche was developing a kind of farm system, the Porsche Junior team in the Carrera Cup in Germany, with a steady stream of talented young drivers in the pipeline. These guys are brought from that series over to enter the GT level of competition in Europe and the US. I didn't really fit into the new Porsche plan, and was released. Alex pushed very hard for me, to no avail, and I really appreciate his effort and support. [gt3r] The 996 is a huge departure from the past 911 designs, talk about the evolution, and the changes that have taken place. The 996 is an exercise in engineering out the power-on understeer; a problem that 911s have had a reputation for, since the beginning. Early 930's compounded this problem with the addition of huge power compared to earlier cars. It works like this...As the car leaves the corner, with power on, the car pushes. The driver naturally cranks the wheel more and more to compensate, realizes that the steering wheel is not working to steer, lifts off the throttle, the weight of the car transfers from the back, to the front of the car, the front wheels hook-up, which turns the car sideways, rear-end comes around very quickly, and the lift throttle oversteer situation is in full play. GT3 R's tend to be a much more neutral car than previous 911 variants. I had a 996 street car for a while and the characteristics are felt all the way through to the GT3 R. I give even more respect to the street cars, because the relationship really is so close. Same goes for the 993 street car compared to the 993 RSR. The 996 is more neutral, more steering sensitive than the 993. The GT3 R tends to bounce a lot, but depends on the set-up. There is a very narrow window that these cars tend to like, and if you are out of the box, it will be much more difficult to drive. 993's are not as picky. It is very helpful to have an engineer and techs that know how to manipulate the car and can communicate with the drivers. I tend to be a slow hands driver, smooth steering inputs, controlled movements; key to speed is smoothness. The GT3 R comes delivered as a fast hands car, which many of the European drivers like. [gt3r] You have driven many of these cars, what are some of the noticeable improvements? The biggest challenge is addressing compromises inherent in taking a car from street production to the racetrack. It is not purely made for the race track. That's why that Cadillac is so radical in World Challenge. When one looks under the rear of a GT3 R you can see the angles of all the links in the rear suspension are not ideal for a racecar. It is in many ways a lowered street car. It is amazing that it still works so well as a racecar. Attempts were made to modify suspension parts, but this is something that plagued everyone at the start. In 2002 revised components helped, and now in 2004 there are things that I've been told that have helped many of the handling hardships the 996 has had from the beginning. As time has gone on, these cars have gotten more settled, and more refined. That's the nature of development, and experience. The cars are still remarkably fast considering it is derived from a 1930's design. The engine in the rear of the car can be also a good thing. The rear weight is good for braking, because the rear brakes can actually do more work. Under acceleration the car can hook up better, with more traction than other platforms. [gt3r] What differences are there between the GT3 Cup 996 and the GT3 R? The GT3 Cup cars are friendly, less sensitive than the GT3 R. The R is more brutal, knife-edged, unless the set-up is really right. The slicks are the biggest difference. The braking, handling - everything happens at more speed, and if anything goes wrong it happens fast. There is a tremendous braking advantage with the GT3 R. A World Challenge GT3 Cup has tremendous power, it's unrestricted, even more power than a GT3 R. Both WC and Grand-Am GT3s have an aero advantage with the smooth front facia, and lack of rear flares. In both platforms the streetcar heritage is clear. [gt3r] Talk a bit about the differences in driving styles, how does it affect the car's set-up. Well it depends on the training of the driver, past experience, and naturally what each person likes. As we get older we tend to put up with less we don't like. We know what we like and stick with it. It's comfortable. When a GT3 R is right it's comfortable to drive, and the car can be faster over the long term. Some Europeans with whom I am familiar have very fast hands and reactions, and as such are very good at driving poor handling cars very quickly. This is one of the challenges I faced when driving with them. Stiffer cars tend to make the tires go off faster as well. It is my opinion that a properly set up GT3 R or RS is a slow hands car, and that it is quickest this way, because the car can be kept at the limit of traction all the time, without constant small corrections. Tires generate more grip when they are on the pavement. I can adapt to anything, but I am not at my best when a car requires high effort, hard braking for example. In the 2000 GT3 R you had to almost step on the pedal with two feet to get it to stop. An enormous amount of effort was needed. When I was running with Alex Job we worked very hard on this over the year and made great improvements. We worked to be able to slide the tire, but not lock it. Now, that is control. Unfortunately for me, my teammates in 2001 liked the high effort. I theorize that it was almost like having ABS, because it was so hard to lock. They could trail brake like crazy. The newer versions now have much larger calipers, and typically lower pedal effort. This is a matter of driver preference. [gt3r] You have mentioned set-up several times, this is important, talk about some of the issues. Again, it all depends on who is driving, and what track. The cars can work with either stiff or soft springs, but naturally the dampers are critical in making sure they can control the springs properly. GT3 R's tend to be very sensitive to the ride heights, and this can actually be a very good way to tune the car, this can calm it down. Rake, or the angle of ride heights from front to rear is critical. Lowering the rear relative to the front slows down the reflexes of the car, raising it quickens the response. Now with power steering, and quick steering racks, a smaller steering wheel can be used, and can be an advantage. This is also helpful with driver changes in pit-lane. I believe the GT3 R needs wing. The wing angle doesn't affect top end speed much, but the addition of a wicker does. I like to run a lot of wing. A lot is going on in the rear of the car with the weight of the engine, and power going down, etc. That is where the GT3 R needs all the grip it can get. It is also helpful with braking from high speeds, in distance and stability. Due to the aforementioned lowered street-design suspension, the geometry does cause the GT3 R to move around a lot when stopping hard from high speed. This is normal, get used to it. By the way, for the same reason, they will move around a lot on high-banked corners as well. It's okay. Get used to it. There are no magic answers with set-up. Certain shock settings work with particular ride heights and springs. It is a package. The trick is to make the car handle with worn tires, if you can do that, the GT3 R is golden to drive almost all of the time. Tires and pressures also affect the handling characteristics. Michelin seems to have the superior product when it comes to GT tires. The have serial numbers on every Michelin tire and all are returned when the car is finished running. This is to help preserve the engineering advantage. And, only the top teams get the best ones. Dunlop and Yokohama are also good choices and popular in the GT crowds. I think Yokohama is maybe a tad faster, but the right choice of Dunlop compound may be better on a long run. The Hoosier race/street tires as used in the Grand-Am Cup series tend to be a 3-4 seconds off a Dunlop slick. Toyos are very similar to the Hoosiers, maybe not quite as fast, perhaps a bit longer lasting. [gt3r] Do different shock brands really make all that of a difference? I have seen excellent results with several brands. SACHS came on the factory cars in 2001, since Porsche had a deal with them. The early SACHS shocks were hard for me to deal with, soon as you touched the accelerator the car snapped sideways (slow hands, again), it was very tricky to put the power down. Later in the year they were re-valved with AJR's help, and were light years ahead of where we were initially. 95% of your lap time in road racing comes from your exit speed out of the corners, so you have to be able to put power down, and get out of the corner fast. If you can work this out, the car will be fast, and the tires will last much longer. JRZ's are good, I like Motons a lot, and Ohlins are good. The Ohlins tend to be soft in the initial dampening, like a pillow. Good on curbs, and for power down. They have a lot of control sensitivity because they move a lot of fluid. But, any shock can be valved many ways. The two biggest challenges are dealing with the streetcar roots, and getting a good set-up. GT3 R's tend to have very little roll, but bounce a lot. The bouncing is somewhat normal, specifically that light front-end. Up and down is fine, but bouncing off line is not. You have to find the happy medium, where it doesn't roll much, and doesn't bounce so much, and doesn't loose grip. [gt3r] Introduction of water to the 911 chassis, what changes did you have? Any advantages? One of the biggest was that it kept the power more consistent. The older air-cooled engines lost power once it got hot. There isn't the heat in Europe to deal with like there is in some of the tracks in North America. We raced in 110 degree heat in Texas, and that didn't affect it. The issue with water introduction was the cooling system and the radiator location. It works great for what it does, but the radiators are very vulnerable. One can not hit the front corner of a GT3 R. In battle they are relatively easy to damage. The early GT3 Cup cars had smaller openings, that mimicked the streetcars, and this proved to not be enough cooling. They are now revised on the new cars. [gt3r] You have driven one of the GT3 R power plants in a Daytona Prototype (DP) what did you think? I drove a Brumos Porsche Fabcar at the 2003 Daytona Rolex 24. It's a great car, but the Porsche has it's work cut out for them, because it is an air restrictor class. Airflow restrictors are used on the engines to limit the maximum power. This works beautifully, except that the large displacement engines reach that maximum sooner, creating a wider torque curve. The Porsche is the smallest in the class, and it is near the end of its development. There just ain't much more power left to be had. The GT3 R engine makes close to the same peak power, but due to this circumstance, it just doesn't have the torque curve to keep pace. Perhaps they will choose a Cayenne V8 or Carrera GT V10 engine. [gt3r] Some points of interest with respect to the choice of Porsche in GT versus other makes. The cars are serviceable, easy to get parts, and items are readily available off the shelf. GT3 R's are very reliable racecars. The water cooled engines not only make more power, but are also more efficient. The GT3 R gets really good racing fuel economy. [gt3r] What are some things you hope to see in the future of the 996 chassis? I know the GT3 R can handle more power, it feels very capable with what it has now when the car is properly set up. It has much more grip than it does power. It would love a turbo. I know some guys in Europe are doing this. There were a couple of Turbo 996 Porsches running at the Nurburgring 24 Hour. Though most rules do not allow it, the GT3 R loves larger rear tires (like all Porsches, right?). I have tried bigger front tires, which often is legal, but the car didn't work as well as it did with the smaller tires. The balance was affected. Larger front and rear would work together well. "I love the cars, they are good race weapons. If only they had quattro like my RS6, haha!"